Chicago Water Taxi service was introduced in 1962. A division of the Wendella company, which is a sightseeing operation that got its start in 1935, this service is based around the more immediate downtown area and caters to Chicago area residents and visitors alike. For residents, the Chicago Water Taxi is often used for work-related transfers, while visitors to the city tend to take advantage of the service for general sightseeing and leisurly trips around the city. Rides are reasonably priced, and it is possible to purchase multi-ride tickets if you wish to use the service for more than just one trip. Children three and under ride for free, as do active military. Chicago Water Taxi tickets can be purchased in advance or in person at the Wendella Dock at 400 North Michigan Avenue or at the Wendella Dock at Trump Tower. This is a seasonal service. Summer is when availability is at its highest. There are five different Chicago Water Taxi docks. One of these docks is conveniently located near Union Station. This dock is known as the Madison/Ogilvie stop, and it is more specifically situated at the northwest corner of the Madison Street bridge at 2 N Riverside Plaza. Union Station is just two blocks away. Plenty of other things are also within walking distance of the Madison/Ogilvie stop, including the Willis Tower and the rest of the downtown "Loop" district. Since Union Station is Chicago’s main train hub, the nearby Chicago Water Taxi dock can be very convenient for train travelers who wish to combine their train rides with water taxi transfers. Chicago’s Chinatown neighborhood holds plenty of interest. The restaurants alone justify a visit. Thanks to the Chicago Water Taxi service, it is possible to take a boat ride down to this Near South Side enclave. When you’re done exploring the neighborhood, you can hop right back on a Water Taxi boat and return to the city core. Regardless of which way you are going, you can savor some pretty spectacular Chicago views, which is surely an added perk. You also won’t have to worry about traffic. The Chinatown dock is located in Ping Tom Memorial Park near 18th Street. 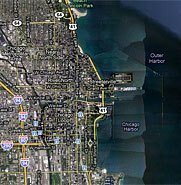 As a side note, there is also a Chicago Water Taxi dock on the Near North Side of the city. It is called the North Avenue at Goose Island dock, and it can be found on the northern edge of Goose Island near such trendy North Side neighborhoods as Wicker Park and Lincoln Park.